When LIMA terminates with multiple branches . . . Is there strong reasons for surgeons to rejoice ? I recently came across an unusual LIMA arterial branching pattern . A naturally dividing LIMA faciliates multiple sequential grafting of LAD or diagonal branches. Surgeons struggle to clip the branches. I need a surgeons Input here. Why do we do LIMA angiogram routinely during coronary angiogram ? 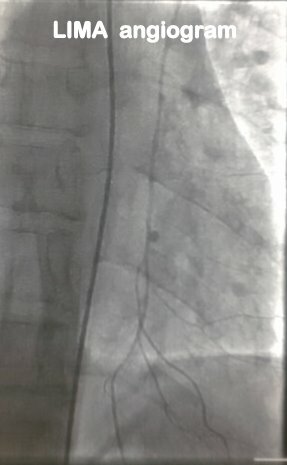 LIMA-Left internal mamary artery is the most common arterial graft used in CABG.It is anastomosed with LAD /and or diagonal artery. 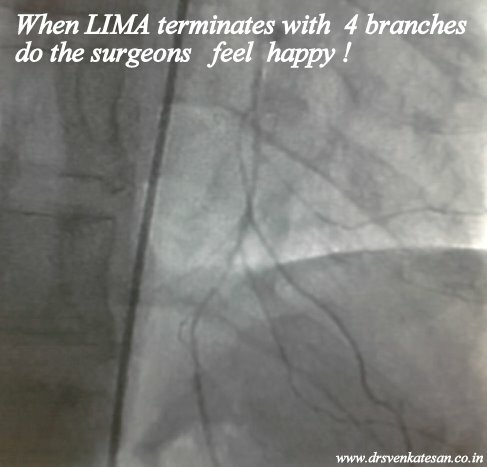 Routine visualisation of LIMA is advocated by many , but it is required only in patients with critical CAD. To confirm the presence of LIMA . To identify any early branching of LIMA .This can divert the blood flow and underperfuse LAD. Tortuosity and looping of LIMA is common but generally has no hemodynamic significance. LIMA may provide vital nutritional support to sternum through direct or intercostal branches .If LIMA dependent sternal blood supply is found to be significant , sufficient precautions to be taken and anticipate sternal ischemia related complications.This is especially important in diabetic subjects.